As a small business owner, you only have so much time to focus on social media. Marketing is rarely given full-time focus in a small business. Instead, it’s wrapped up into other necessary coverage like sales, content development and design. Where do you draw the line of knowing what’s necessary and what’s not? In this guide, we’ll provide a selection of Twitter tips all geared for a small business. Looking for more information small business resources? See our thorough guide to social media for small business or our full guide to all things small business marketing! Is Twitter useful for small businesses? So is Twitter useful for small businesses? The answer is that it depends on your industry, your audience and your available resources. Twitter’s own study explored their audience’s behavior and how it impacts brands. It found that Twitter users, compared to the general online population, were more likely to discover new things, were more open-minded and they like being the first to try new things. 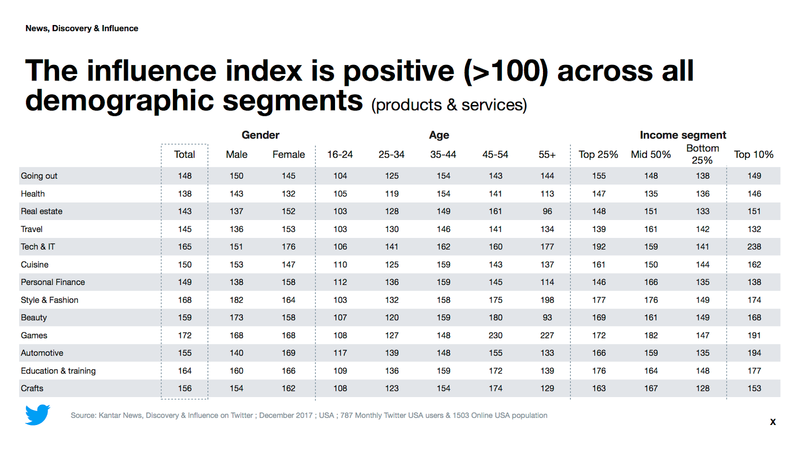 In addition, when it came to products and services, Twitter users in the US had a positive influence index across most demographics and topics. So if your small business’ target audience fits within Twitter demographics, then it’s probable that Twitter could be useful for you. You’ll be able to get in touch with an audience that values experiences and influences their network of follower, which can make them receptive to your brand and potential advocates for it. Let’s move on to how you can get the most out of Twitter as a small business. Setting social media goals is necessary for any network that you take on. If you don’t have goals, then you don’t have metrics and that leads to sporadic posts. Choose three to focus on. Any more will divide your time and affect your focus. Once you have these in mind, write them down and determine your metrics, such as mentions or link clicks. These metrics will come in handy later when you’re taking a look at your analytics reports. Social monitoring is tracking what people are saying about you (or someone else) online. It can be used to find new sales leads, track customer sentiment and even check in on what your competitors are doing. Social monitoring also helps improve your content sourcing, one of the most time consuming parts of social media management. Learn how to use Twitter advanced search to set up parameters for your brand that will help you stay on top of even indirect mentions of your business. The Sprout Smart Inbox feature comes in handy here for searching across multiple networks. Enter brand keywords and common search terms associated with your brand and the messages will display right along with any @mentions. So even if someone doesn’t mention your brand by name or misspells it, you’ll still be there to help them out. For small businesses, you might have only one or two locations to focus on. Another handy search function is searching location tagged Tweets with a set mile radius. If you’re a burger restaurant and someone Tweets about “need burger rec” within 2 miles of your zip code, the message will come in and you’ll be right there to offer your restaurant up. Takeaway: Automating your social monitoring comes in handy because you don’t have time to chase down every lead. Have the leads come to you. If you’d like to try out these search parameters but don’t have Sprout Social, you can save your searches in Twitter or sign up for a demo. Twitter favors media that is uploaded to its own platform over sharing from another. If you have a photo that you want to share, it’s better to upload it than to post a link. Twitter photos and videos receive a larger preview treatment while photo links have smaller ones. A native video may automatically begin playing for a user while a YouTube link still requires someone to click through. An eye-catching photo or video goes a long way when you’re scrolling down your timeline. Madcap’s photography is used in most of their Tweets. You can’t miss them. 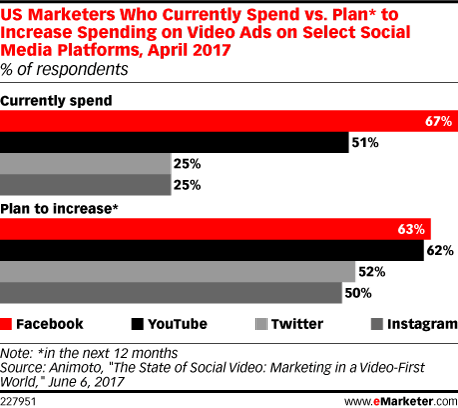 Marketers are planning to spend more on video ads because they work. Even without the ad part, video Tweets are six times more likely to be Retweeted than photo Tweets and three times more likely to be Retweeted than GIFs. One study examined Twitter ad video lengths and placements. 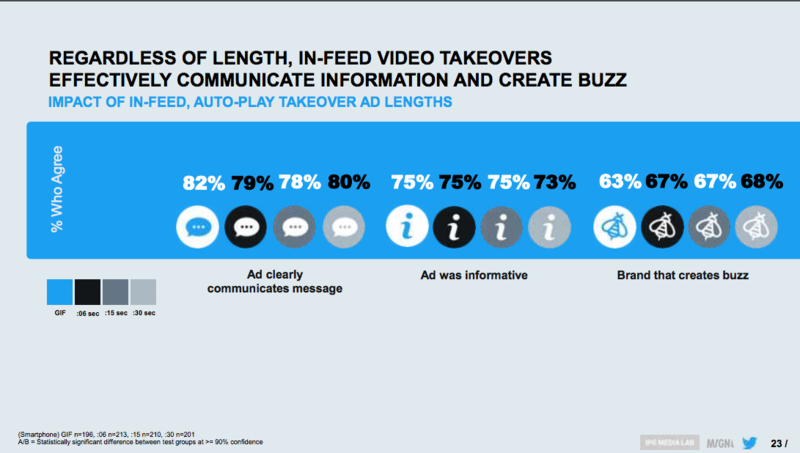 It found that regardless of length, in-feed video ads were effective in communicating a brand’s message, being informative and creating a buzz. Takeaway: Upload your media natively to Twitter. Adding video ads to your Twitter strategy will help increase brand awareness. This is great for new product launches or informational campaigns. As mentioned before, sourcing content takes time. Make it easier on yourself by repurposing your existing brand content. Due to the nature of a fast-moving timeline, a Tweet doesn’t last very long on Twitter. This means that your followers might not have seen what you Tweeted even five hours ago. To combat this, don’t be afraid to Tweet the same content several times over the course of a week, month or even year if it’s evergreen. 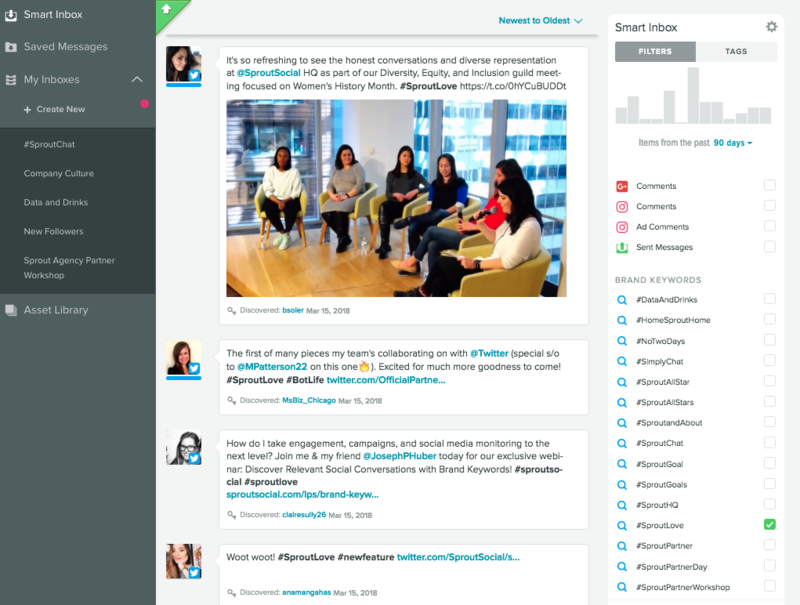 For each Tweet with the same content, switch up the featured media or text that’s accompanying it. Using an easy scheduling software like Sprout cuts down on time. You can queue or schedule your Tweets on Monday and rest easy for the rest of the week. Recent changes at Twitter mean that they’re cracking down on spam and spam-like content. The new Twitter timeline features “In case you missed it” and “best Tweets” sections that favors Tweets from accounts you’ve interacted with before or Tweets that Twitter thinks you’ll like. This section might help out your business but don’t count on it to be your only tactic. In fact, Twitter already responded to user feedback by offering an option to turn this section off. Takeaway: Tweet your content and tweet it often, again. Your content does not have to be solely branded. Separate your content sourcing and your scheduling time. Content sourcing includes finding relevant industry news, blog posts and learning industry trends. Identify the news and publications that are most relevant to your industry. Set up alerts for these sources or add them into your RSS reader. For your brand, set up keyword alerts. And for the hot topics of your industry, take a look at your timeline to see what everyone else is talking about. The easiest way to see what today’s topic is is to add every new follow to a list. Do you have some major influencers in the food industry? Add them to a private list. Check this VIP list often for new content to Retweet. 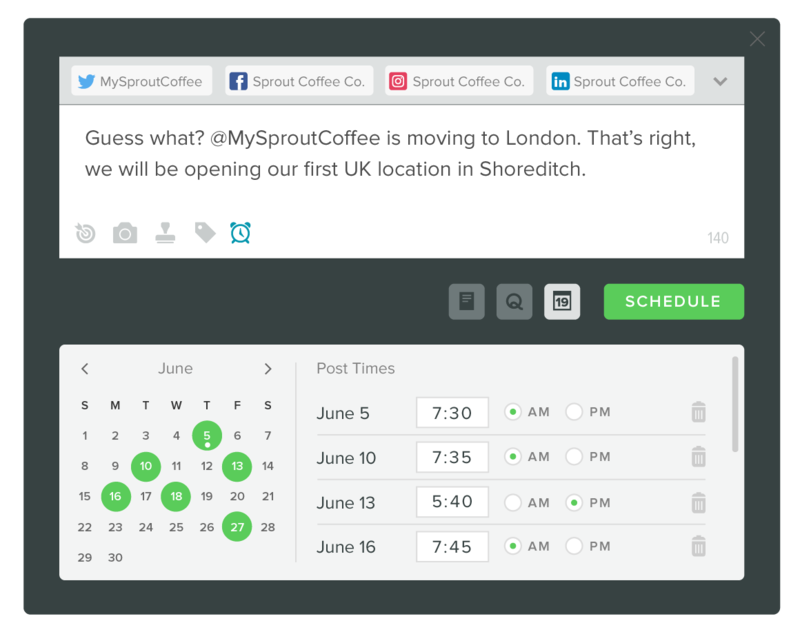 Sprout makes it easy for you to find content. 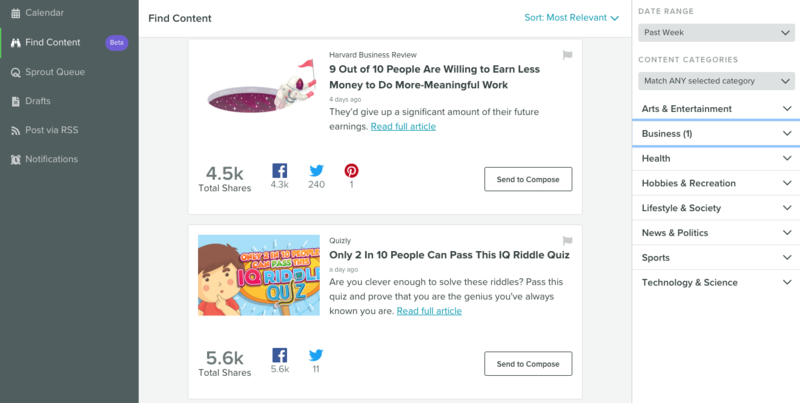 The Find Content feature highlights the viral pieces of content in the major industries. Use this to see what people are talking about, how popular it is and compose without ever leaving the window. 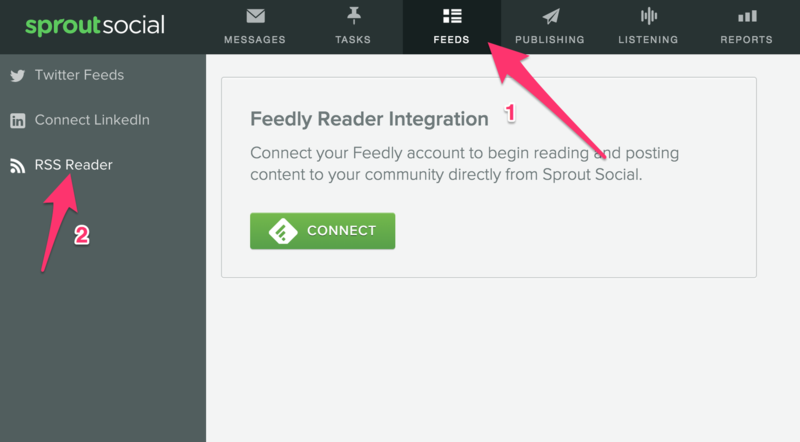 If you use Feedly to connect your RSS readers, you can easily use one of their integrations, including Sprout, to schedule your Tweets. Takeaway: Use automation like an RSS reader or keyword alerts to get content relevant content delivered to you instead of searching for it. Set time aside to source this content. Your brand voice is what will make you stand out from the crowd and compete with the bigger brands. Our guide here will help you develop your unique brand voice. This strategy only takes commitment. You don’t need to Tweet often, you just need to stay consistent. Berkeley Bowl is a supermarket that is known for its snarky and funny Tweets. You wouldn’t think a supermarket would have a brand voice, but theirs handles it well. Takeaway: Creating a brand voice will help you stand out in the timeline. A little snark and humor goes over well on Twitter. This may sound like a generic Twitter tip but it’s especially important for small businesses. Do you want to increase your sales via Twitter? The make sure people know who you are, what you’re selling and how to buy it. You can put your shop link into your bio or pin it to the top of your profile page. Don’t forget that your cover photo and profile photo provide ample room for you to get your message across. Do you want people to Tweet more about your brand? 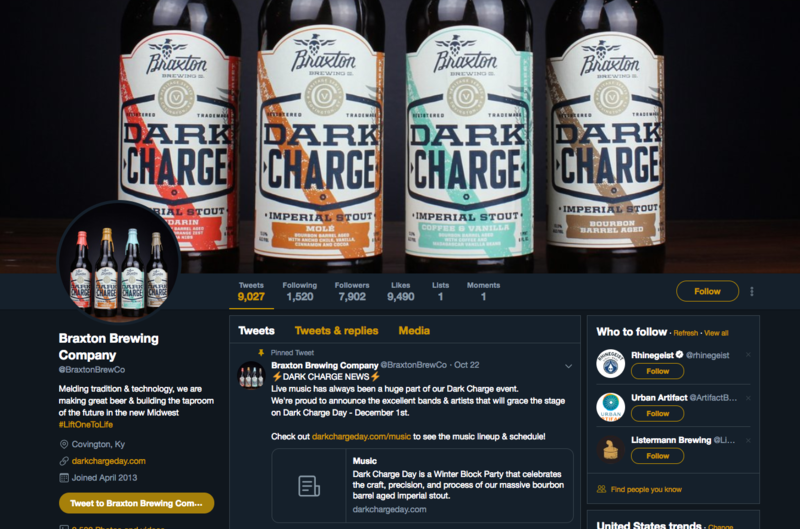 Add your branded hashtag into your bio like Braxton Brewing Company did. The company also pinned an upcoming event at the top of their page. It’s a direct sale page for tickets and will be there for anyone to easily see when they visit their profile. Takeaway: Brand your profile page out and put your goals front and center. Small businesses are low on time and resources. The best ways to combat this and still get what you want out of Twitter is to invest in software that improves your efficiency and take on a few strategic improvements at a time. Twitter moves fast so it’s okay try out a few different strategies. Once you find one that works for you, stick with it until the next change that Twitter makes affects it. Hungry for more? Check out our small business marketing guide to learn more! Jenn Chen: Jenn Chen is an SF-based digital strategist, photographer, and writer who works with specialty coffee companies to make them look awesome online. She also has a penchant for cake donuts. Connect with her online @thejennchen & at jennchen.com.